The Green Mountain State derives its name from “Verd Mont,” the term given to the area by French explorer Samuel de Champlain. Originally an independent Republic, Vermont was admitted to the United States as the 14th state in 1791. 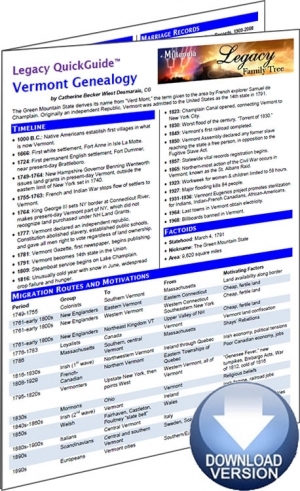 The�Vermont Genealogy�Legacy QuickGuide™ contains useful information including a timeline of Vermont history events, tips on Vermont research strategy, an outline of major immigrant groups, and more. Also included are links to websites and resources covering vital records, church records, census records, as well as general Vermont resources. This handy 5-page PDF guide can be used on your computer or mobile device for anytime access.